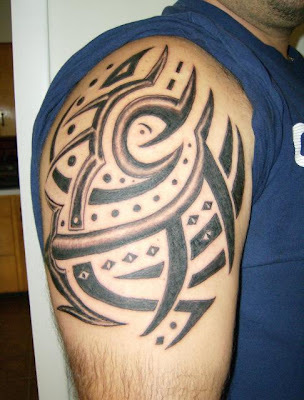 A tribal tattoo is quite an extreme tattoo; it is a black design that is usually applied to the upper arm or back. The original wearers of tribal tattoos used the designs to show their status within their community, it served a purpose to warn others of their rank. This is obviously no longer the case; however it is worth taking the time to understand the importance of the tribal tattoo before having one done. Taking the time to understand the culture and history of a tribal tattoo, shows a level of respect to a civilisation that has long passed. Although, that being said we no longer look at a person's tattoos to establish their success as a hunter. Nevertheless, it is important that the original inspiration remains.